Hold onto your privates. Your private stash of nuts, that is! August 3 is National Grab Some Nuts Day, and we’d hate for you to come up short. Humans have been grabbing nuts for about as long as nuts have been around to grab. Archaeologists unearthed evidence of this fascination with nuts at a site in Israel, where seven different varieties of nuts were discovered, along with the stone tools needed to crack them open. The site was estimated to be 780,000 years old, and included almonds, water chestnuts, acorns, and pistachios. Nuts were also popular closer to home; Native Americans frequently used “hammer stones” to crack open beech nuts, chestnuts, walnuts, pecans, and hickory nuts, which were either eaten whole or ground up into a nut butter. Other folks around the world prized nuts for their oil, or turned them into a powder used for thickening foods. Nuts pack a nutritional punch, making them a great source of energy and protein. Nuts also have a very strict definition, which means that some of the nuts you think are nuts aren’t really nuts. That’s nuts! By definition, a nut is a fruit composed of a hard shell and a seed. So far, so good…but read the fine print: that shell must not open to release the seed. So, from a botanical standpoint, hazelnuts, chestnuts, and acorns are all true nuts. Peanuts, almonds, cashews, walnuts, and pistachios? They’re nuttin’ but wannabes. Though technically incorrect, any large, oily kernel found within a shell and used as a food source is considered a nut. So Planters, you’re off the hook. One reason nuts are such a popular snack is due to their health properties. They are considered a “superfood” high in healthy monounsaturated fat and other good-for-you nutrients including vitamins E and B2, folate, fiber, magnesium, phosphorus, potassium, copper, and selenium. They tend to be high in calories though, so a handful at a time is plenty. A day rarely goes by where I don’t grab some nuts, so today’s food holiday was easy to conquer. 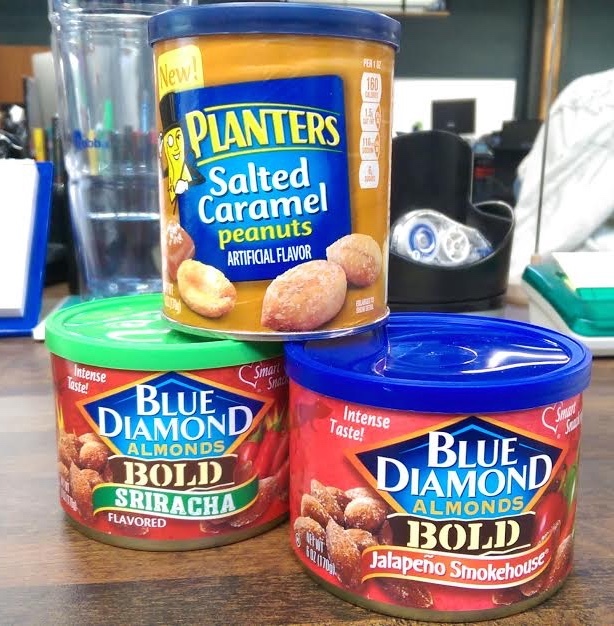 I’m particularly fond of Blue Diamond’s lineup of bold flavored almonds, so I indulged in some Sriracha and Jalapeño Smokehouse nuts. For dessert, I added a few Planters Salted Caramel peanuts.